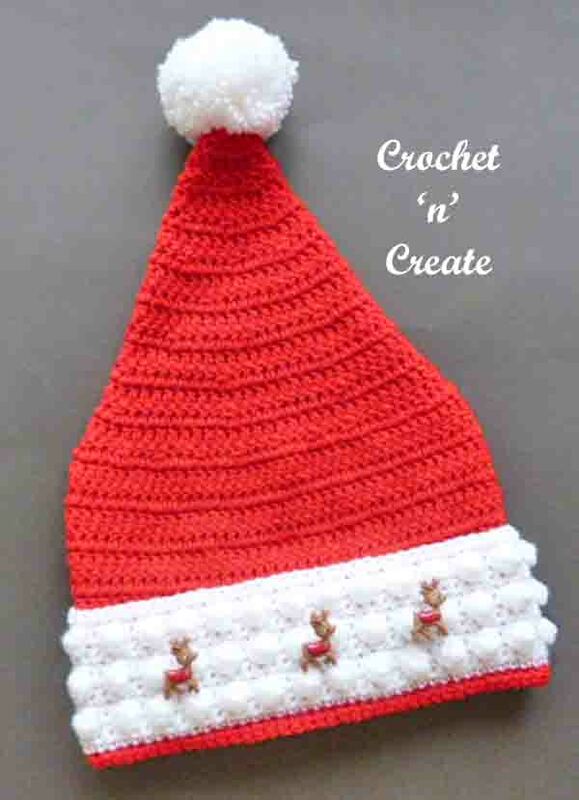 Santa Hat Free Crochet Pattern – A Santa hat pattern, spread the Christmas cheer and add a little ho-ho-ho to your holiday with this free Santa pop-pom hat crochet pattern. 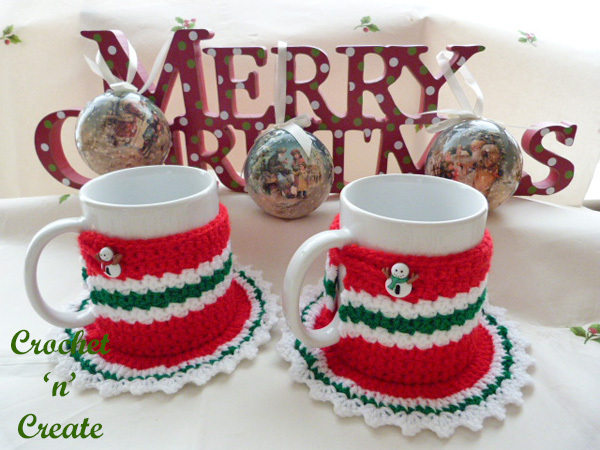 It is easy and fun to make and will bring festive joy to your family. 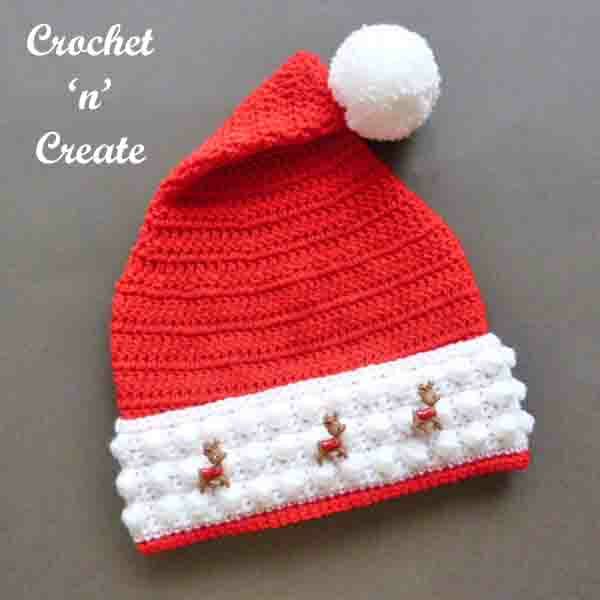 This entry was posted in christmas patterns and tagged christmas crochet, christmas Santa hat, crochet, crochet santa hat on 21st November 2018 by crochetncreate. 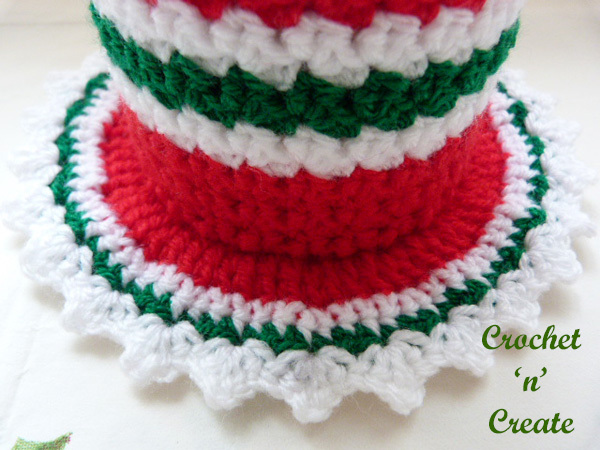 Santa Hat UK Free Crochet Pattern – An easy and fun to make hat that will bring you festive joy, add some jolly ho-ho-ho to your Christmas holiday with this free crochet pattern for Santa pom-pom hat. A project I am sure you will enjoy. Bobble. Leaving the last loop of each tr on hook, work 5tr into next dc, yrh and draw through all 6 loops. Leaving the last loop of each tr on hook, work 1tr into each of next 2tr, yrh and draw through all 3 loops. With 6.00mm hook and colour 1 make 80ch, ss to first ch to form a ring. 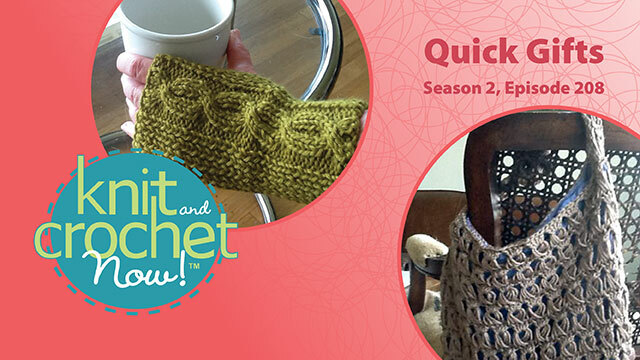 Row Two to Twelve – 3ch, 1tr into each tr to end, ss to top of 3ch on beginning of row. Turn. Row Thirteen – (Dec) 3ch, 1tr into next tr, * dec 1tr over next 2tr, (see abbrev) 1tr into each of next 2tr, * rpt from * to * to last 2tr, dec 1tr over next 2tr, ss to top of 3ch on beginning of row. Turn. Row Fifteen – (Dec) 3ch, 1tr into each of next 7tr, * dec 1tr over next 2tr, 1tr into each of next 8tr, * rpt from * to * to last 2tr, dec 1tr over last 2tr, ss to top of 3ch on beginning of row. Turn. Row Seventeen – (Dec) 3ch, 1tr into each of next 6tr, * dec 1tr over next 2tr, 1tr into each of next 7tr, * rpt from * to * to last 2tr, dec 1tr over next 2tr, ss to top of 3ch on beginning of row. Turn. 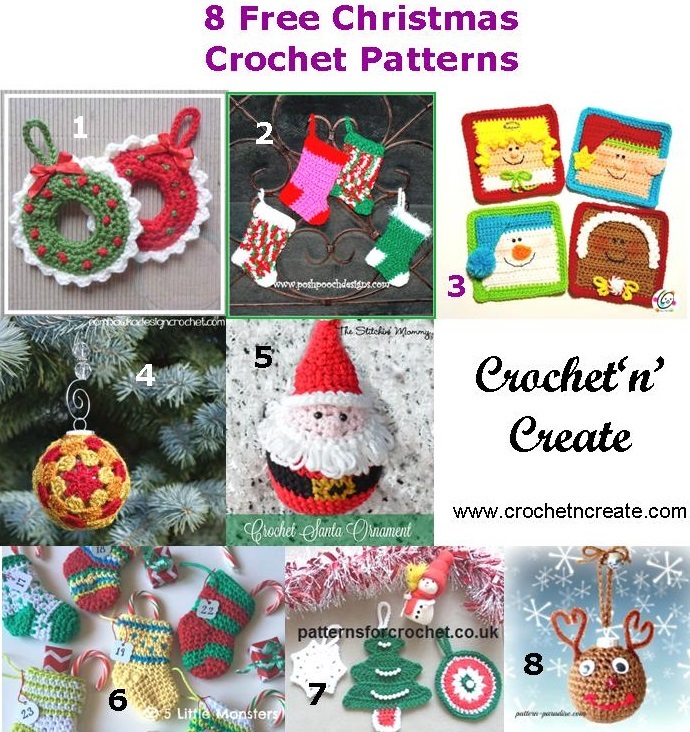 Row Nineteen – (Dec) 3ch, 1tr into each of next 3tr, * dec 1tr over next 2tr, 1tr into each of next 5tr, * rpt from * to * to last 2tr, dec 1tr over next 2tr, ss to top of 3ch on beginning of row. Turn. Row Twenty one – (Dec) 3ch, 1tr into each of next 3tr, * dec 1tr over next 2tr, 1tr into each of next 5tr, * rpt from * to * to last 2tr, dec 1tr over next 2tr, ss to top of 3ch on beginning of row. Turn. Row Twenty Three – (Dec) 3ch, 1tr into each of next 2tr, * dec 1tr over next 2tr, 1tr into each of next 3tr, * rpt from * to * to last 2tr, dec 1tr over next 2tr, ss to top of 3ch on beginning of row. Turn. Row Twenty Five – (Dec) 3ch, 1tr into next tr, * dec 1tr over next 2tr, 1tr into each of next 2tr, * rpt from * to * to last 2tr, dec 1tr over next 2tr, ss to top of 3ch on beginning of row. Turn. 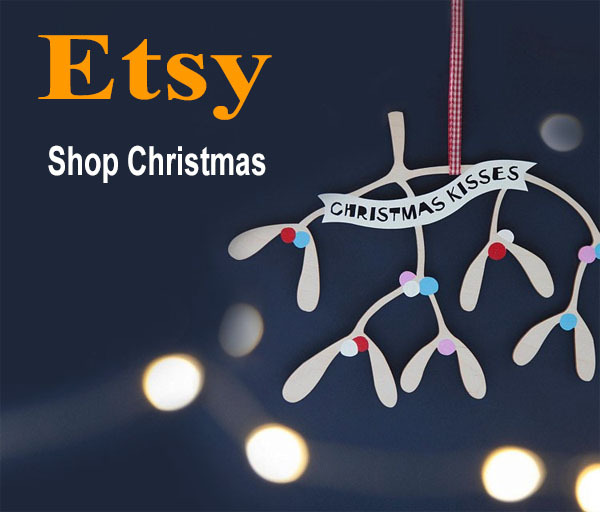 Row Twenty Seven – (Dec) 3ch, * dec 1tr over next 2tr, 1tr into next tr * rpt from * to * to last 2tr, dec 1tr over next 2tr, ss to top of 3ch on beginning of row. Turn. 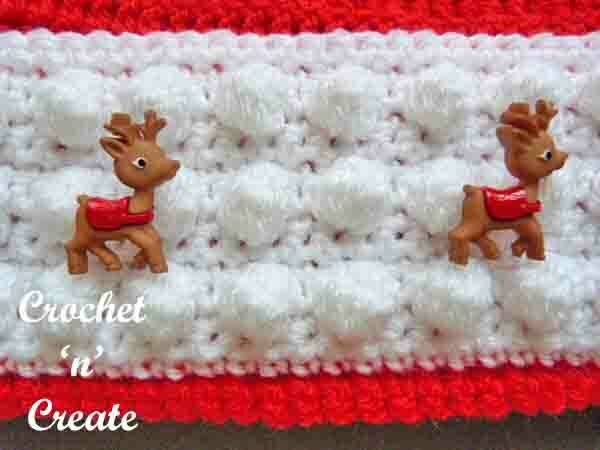 2nd Row – Work into the back loop of stitch only for this row. Using colour 2 yarn, make 1ch, 1dc into base of 1ch, 1dc into each dc to end, ss to first dc on beginning of row. Turn. 3rd & 4th Rows – 1ch, 1dc into base of 1ch, 1dc into each dc to end, ss to first dc on beginning of row. Turn. 7th & 8th Rows – 1ch, 1dc into base of 1ch, 1dc into each dc to end, ss to first dc. Turn. 9th Row – 1ch, 1dc into base of 1ch, 1dc into next dc, * make a bobble into next dc, 1dc into each of next 2dc * rpt from * to * to last dc, make a bobble into dc, ss to first dc on beginning of row. Rpt 6th to 9th Rows once more. Turn. Rpt 6th & 7th Rows. Turn brim back onto hat. 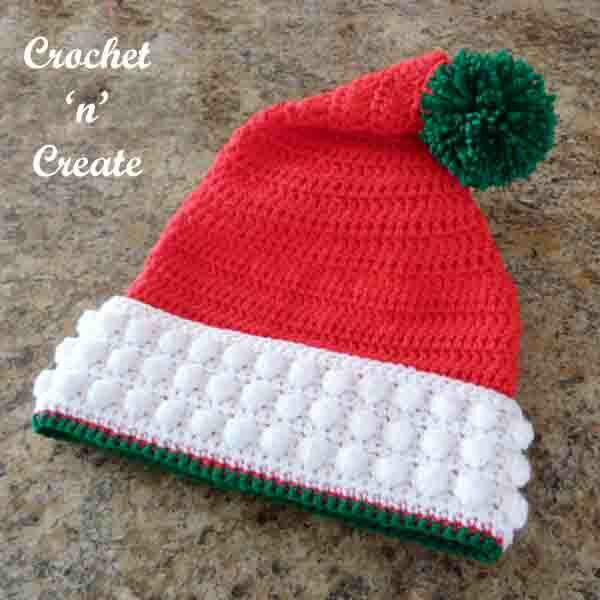 Using Clover pom-pom maker No 65 and colour 2 make a pom-pom and attach to the top of the hat. 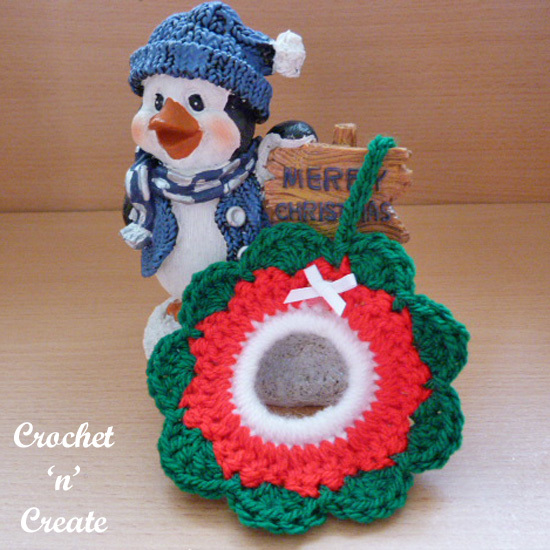 You can use a third colour if you wish for pom-pom and Rim. 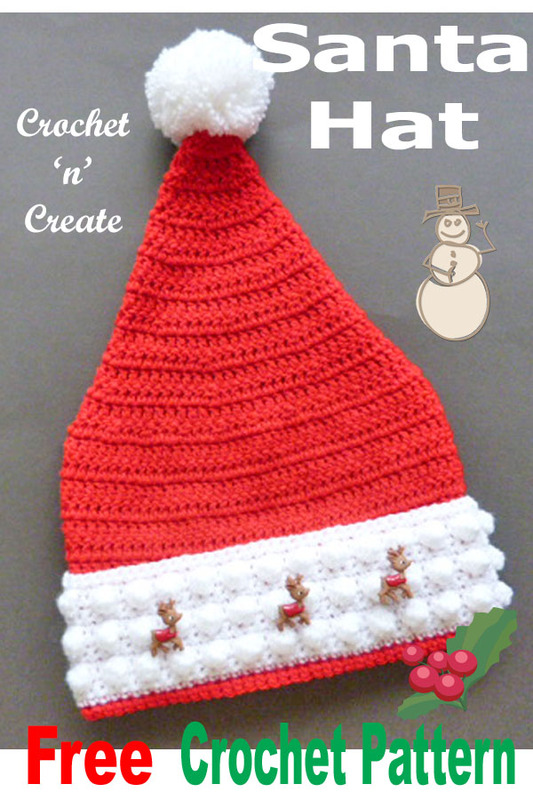 The written instructions and pictures for this santa hat UK free crochet pattern are copyrighted to crochet ‘n’ create © 2018. 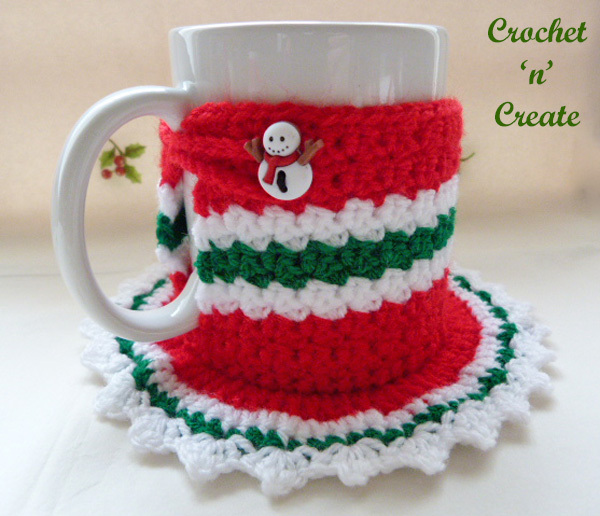 You are welcome to sell the finished products made from the santa hat UK free crochet pattern , I just ask that you please use your own pictures and put a link back to crochet ‘n’ create. 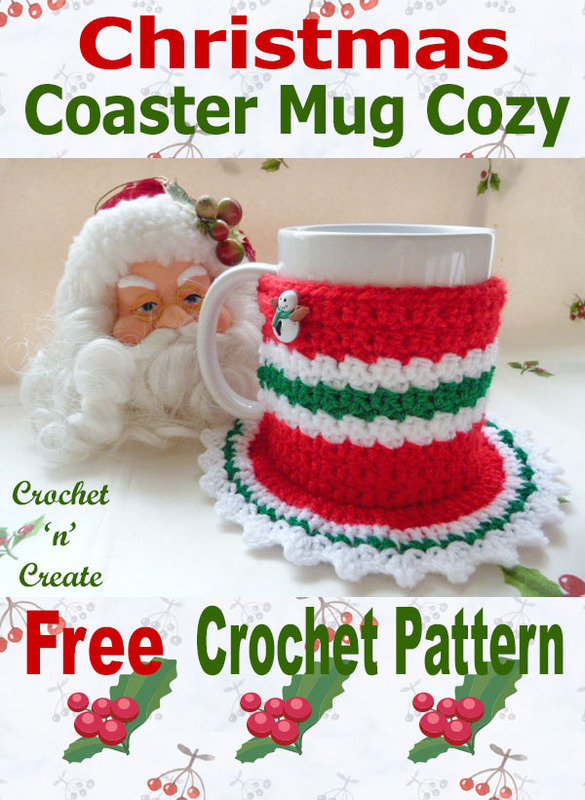 DO NOT share the written instructions for this santa hat UK free crochet pattern. 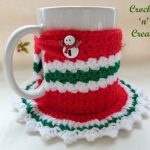 This entry was posted in christmas patterns and tagged christmas crochet, christmas Santa hat, crochet, crochet hats on 21st November 2018 by crochetncreate. 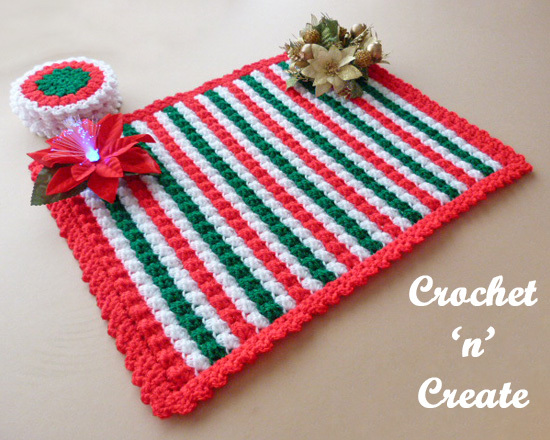 This pretty crochet Christmas table mat will look delightful on your table during the festive holiday, use as center piece or as an extra mat during meal times, made in different colors it could be used all year round. 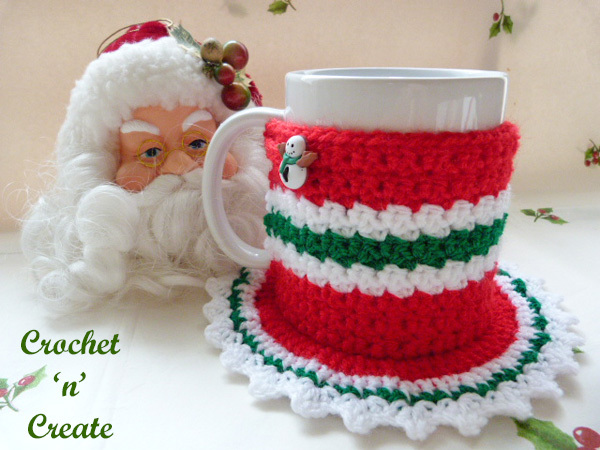 Whatever you use it for I hope you have fun crocheting it. 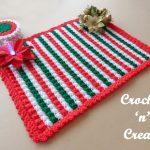 This entry was posted in christmas patterns, crochet for the home and tagged christmas crochet, crochet, crochet for home, free crochet patterns on 16th November 2017 by crochetncreate. 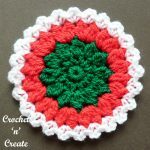 Crochet this pretty little Christmas tree wreath, at just over 3 inches in size, it is perfect to hang on your tree. 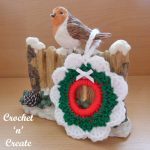 Made in beautiful festive colors this ornament can also be used to hang around your home as decoration. 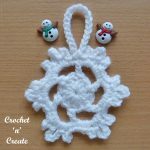 This entry was posted in christmas patterns, christmas tree decorations and tagged christmas crochet, christmas tree decorations, free crochet patterns on 7th November 2017 by crochetncreate. 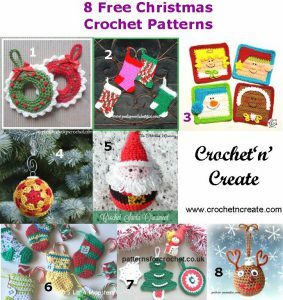 This entry was posted in Free Crochet Pattern Finds, Round Ups and tagged christmas crochet, crochet, crochet patterns, crochet stitches, free crochet patterns, free pattern on 12th November 2016 by crochetncreate.